This is NOT a real tutorial, but an image showing the start of basically every Half Persian chain weave 'on a wire'. Just start with a 'n-on1' segment, where 'n' resembles the to be made HP-'n'-in-1 chain. The remainder is proper threading above/below the guide wire, and then weaving, according to the image. Just look closely, and you won't need a tutorial. BTW, I let that 'orphan' ring at the left attached to the chain - it makes life easier, if I want to join two segments, or the chain to a circle, as simply the layering pattern has to be continued to join. 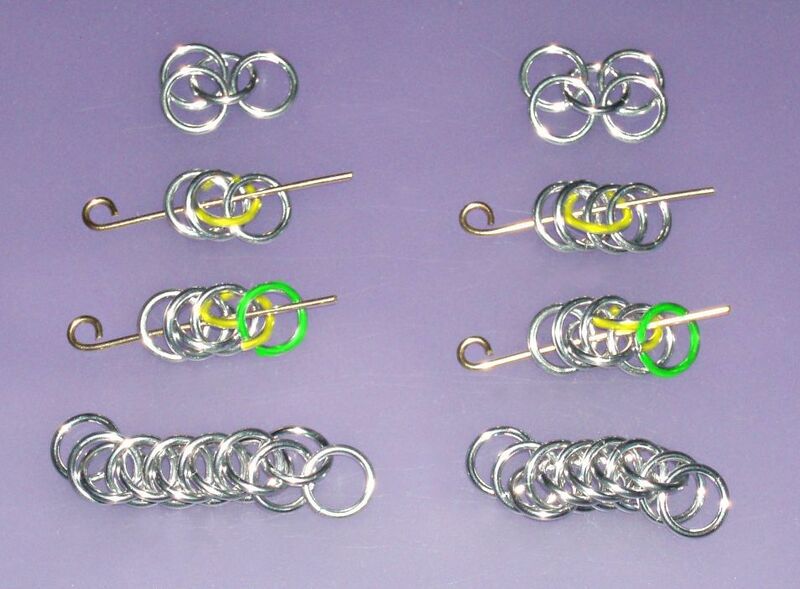 Rings used for the weave samples are 1.6mm (16swg) coiled on 5/16" (~8mm) mandrel - these AR~5.2 rings work fine for HP3in1 and HP4in1 as shown, and these weaves work also with smaller rings; 'higher' HPs need adjusted, higher ARs. Note that the 'active' rings are marked yellow in the image; preclosed rings to be added are marked green. In fact you can always prepare half of the project's rings preclosed, as everytimes one preclosed ring is added with an opened joining ring. So this is also a fine method for making stretchy claspless bracelets, if 'rubber' rings are used for that purpose. Oh, and after four or five repetitions of adding a preclosed ring with an open one the guide wire can be removed, as the weave segment is now stable enough to continue without.